Seated from Left:Lara Verdone, Susan McCumber, Rebecca Vanderheyden, Michelle Quednow, Linda Hennrich. Standing from Left: Jason Quednow, Paul Casler, Keith Write, Mike Casey, Phil Dopkins, Steve Shaw, Harvey. 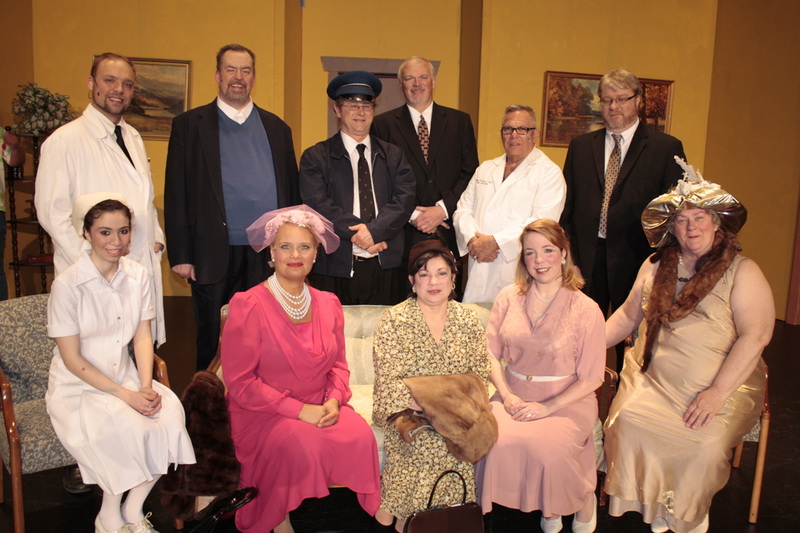 Harvey is a beloved Pultizer Prize winning play by Mary Chase. It stars Elwood P. Dowd as a lovable eccentric who counts among his many friends a six-foot, three-and-one-half inch tall invisible rabbit. This gentile comedy has been a favorite of JLT's for many years. This 2010 production was JLT's Fourth production of Harvey and Mike Casey's third performance as Elwood Dowd for Janesville Little Theatre. This production was dedicated to Jeanene Van Tassell Welker. Jeanene has been active in Janesville Little Theatre since childhood. Her roles have included singing and dancing in addition to comic and dramatic speaking parts. And that's only the beginning. Jeanese has served on the board of driectors, including as president. She has built and decorated sets and handled props. For many years she has been JLT's wardrobe mistress and has costumed more than 40 plays. The expression "no one is indispensible" does not apply to Jeanene.